Basic care for your cat requires knowledge of its daily habits and individual personality. Your cat needs your attention and love just as much as dogs and other pets. A well cared for cat will usually live a long and healthy life, bringing a great deal of joy into its owner's life. For this reason you should take special care of your feline and make every effort to educate yourself regarding its proper treatment. New owners should take their cat to a veterinarian for a health check-up. Should you feel that your cat has a health problem, never hesitate to consult your veterinarian for proper diagnosis and treatment. Many veterinarians will also provide information and tips regarding the everyday care of your cat. One reason for the popularity of cats is their reasonable maintenance requirements. The feeding, grooming and health care needs of the average cat are straightforward and rewarding for owners. Learn how playing satisfies several basic needs for your cat. Learn how, when, and what to feed your cat. Read about the basics of bathing and learn how to make it less stressful you and your cat. Discover how to groom your cat like a pro. Read about common litter box problems and how to solve them. Play is an important factor in your feline's life. Whether your cat is a kitten or an adult, it should receive an ample amount of time to exercise and play. Play is especially important for kittens. Through the act of playing, kittens learn skills that will help them survive as adults. Kittens need playtime as a major part of their daily routine. A playing kitten is not only having fun, but acquiring vital life skills as well. Although some people may overreact when they observe kittens wrestling or playing rough, it is important to remember that this play is an essential component of their childhood and quite normal. Seldom will kittens actually harm one another. Playing is also an important part of an adult cat's life. It is believed that cats that are able to play frequently are typically less stressed and neurotic than other felines. These cats benefit from the exercise and tend to have fewer problems with obesity than cats who do not play often. As a responsible cat owner, you should help ensure that your cat is able to play and exercise at home. Several easy methods are available should you wish to indulge your cat's playful nature. Remember that, like people, cats can also become stressed and tense. In order to reduce your cat's stress, let it play and exercise regularly. You will also feel more relaxed. Simple Toys Your Cat will LOVE! • Roll up some old newspaper into a ball for your cat. • Let your cat play with a paper bag or cardboard box (shoe boxes are perfect!). • Purchase toy mice, feathers or other toys. string or shoe lace around the top. also tie the string to a stick. an empty film canister for a mobile toy. The dietary requirements of a cat are unique and you should have a basic understanding of how to properly feed your cat. Felines that are fed the correct foods will usually live a longer and healthier life than other less cared for cats. Cat owners should be careful what they feed their cats and try to prevent bad eating habits from forming as soon as possible. Several guidelines are available to ensure the continued nutritional health of your cat. Most cats thrive on good quality, commercial cat foods. Many experts recommend feeding cats a variety of canned and dry food to avoid food addiction. Cats that are fed a single ingredient like liver and fish are often prone to health problems. • Foods that identify the manufacturer. You should always check with your veterinarian before adding supplements to your cat's diet, since some of these may actually harm your pet. By creating a routine for your cat's mealtime, you can help keep your feline healthy and happy. Contrary to popular belief, cow's milk is not recommended for cats. Instead give your cat plenty of fresh, clean water. Water should always be available for your cat, regardless of diet. If you have several cats in your household, do not feed them from the same dish. In this situation, the dominant cat will usually get more of the food and create mealtime stress for the subordinate feline(s). Feed your cats from separate bowls in order to make mealtime more enjoyable. Since cats are generally very good about keeping themselves clean, they do not often require bathing. Cats usually do not appreciate being bathed, but the occasional bath may be necessary. • Your cat's coat is very dirty and greasy. 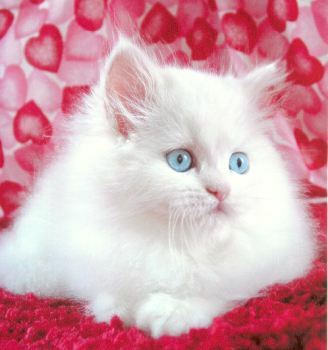 • Your cat's fur is matted and ungroomed. • A poisonous material is in your cat's fur. • You need to give it a flea, tick and lice dip. • Your cat is going to be in a cat show. Many long haired cats are extremely susceptible to matted fur and hairballs. Matted fur can become contaminated with feces and may actually damage the skin itself. Cutting mats out should only be done by the experienced as it is quite easy to cut your cat's skin. If your cat's fur is severely matted, your best course of action is to contact a veterinarian. As you may already know, most cats do not like water and may struggle when you try to bathe them, even if this action is for their own good. The following tips will help make your cat's bath time a less stressful occasion for both you and your feline. • Try to bathe your cat in a sink or plastic tub. This is less threatening than a large bathtub. • Provide a rubber mat to prevent your cat from slipping. • Pre-adjust the water temperature and lower your cat into an empty tub before filling it with water. This works better than attempting to lower your cat into standing water. • Gently wet the entire coat to the skin, being careful to avoid the eyes and ears. • After you have lathered shampoo into your cat's coat, be sure to completely rinse it out all traces of shampoo. A gentle spray attachment is easiest to use here. • Gently towel your cat dry and carefully comb its hair. Remember to give your cat plenty of love and attention before and after its bath. This will make bath time more enjoyable for both you and your pet! Many people are fascinated by cats' grooming habits. When cats groom, they try to reach every part of their fur with their tongue. Cats generally do not need to be groomed by their owners, although it is helpful to assist your cat in caring for its coat. All cats can benefit from frequent brushing and the social interaction as well. • Many short-haired cats like being brushed with a soft bristle. • Be careful not to scratch your cat's skin by brushing too hard. • You may wish to rub your cat with a cloth after brushing. This will help bring out the natural color in its coat. Even though long-haired cats will groom themselves, frequent inspection will help you determine when you should assist them. This will prevent them from developing matted fur and skin problems. To groom a long-haired cat use the following guidelines. • Praise your cat often during the grooming process and take frequent breaks if your cat becomes upset. Cutting your cat's nails can at first seem a daunting task, but after doing it once or twice it's actually quite simple. To trim your cat's claws, press its paw gently so the whole length of each claw is exposed. Using a quality nail trimmer designed for use on cats carefully cut just the tip of the nail avoiding the quick (the pink area). If you are unsure of where the quick is, hold your cat's paw up to the light. You will be able to see the portion of the nail that you can safely clip without nicking the quick. If you have any questions whatsoever about trimming your cat's claws or feel uncomfortable doing it, ask your veterinarian, veterinary technician or groomer to show you how. Common grooming tools for cats. Cats are naturally very clean animals. Not only are they very fastidious about their grooming and cleanliness, but they are also very particular about their litter box activities. Once trained, cats will generally use their litter box on a regular basis. Cats that exhibit a change in their litter box habits may actually have a serious health problem and a consultation with your veterinarian is advised. • Keep the litter box in a private, quiet area and ensure that the kitten can easily use the box. • Move the box near your kitten, or vice versa, when it looks like it is ready to urinate. This will also stimulate the kitten to urinate and defecate. • Never rub your kitten's nose in its waste if it goes in the wrong spot. This is totally ineffective as a training tool and will make your cat fearful of you. • Clean all inappropriate waste areas completely. Cats may regard these uncleaned areas as the proper place to urinate in the future. • You may have to try different types of litter if your kitten seems unreceptive to your first choice. • Be patient, and observant. You are establishing the habit of a lifetime. Proper litter box maintenance benefits both you and your cat. Many cats will not use their litter box if it is too dirty or in a busy section of the house. They like their litter to be fresh and clean. If you have multiple cats, make certain that the box is big enough for all of them to use. Some cats even prefer their own box, so be ready to provide more than one if necessary.